Are you having trouble keeping track of everything you need to buy for your loved ones this year? Download the mGifts app, which allows you to create helpful lists of the people you need to buy for and what you should buy them. The app also allows you to set a budget for each person and a total budget, so it can alert you when you’re about to reach your limit. The best part? If you don’t want others to peek at your holiday plans, protect your lists with a four-digit passcode so no one else can see. Many people take trips during this time of the year to see loved ones who live in different states. If you plan on taking multiple trips, download the TripIt app to help you organize your travel plans. How does it work? Simply send your travel plans to plans@tripit.com and the app will keep all of your flights and check-ins organized. It even sends you reminders prior to upcoming trips, and suggests popular hotels and restaurants in the city you’re visiting. This holiday helper app helps you stick to a tight budget this holiday season, rely on coupon apps such as RetailMeNot. Once you download the app, you can either search for a specific store or scroll through the featured deals to see which stores are offering deals or discounts on that day. Find the store you’re looking for and then present the app at checkout to take advantage of the special deal. 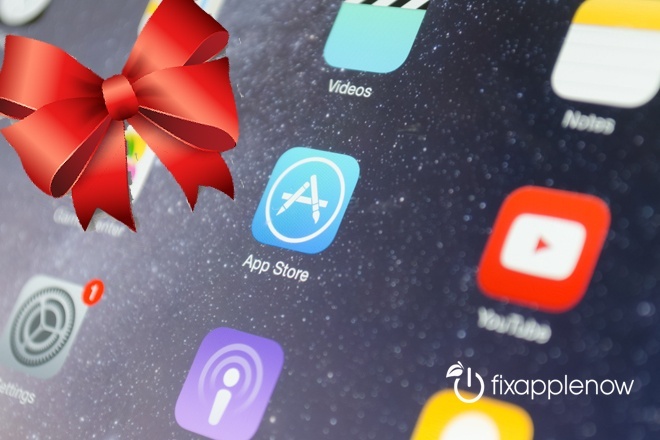 Keep this app handy to help you find the gifts you need for your loved ones without having to break the bank. Between baking cookies and frantically finding gifts for everyone on your list, it’s difficult to find time to send holiday cards to all of your loved ones. But, apps such as TouchNote make it much easier for busy families. Simply take a picture, or choose one from your smartphone’s photo library, add a caption of your choice, and hit submit. Once you enter your loved ones’ home addresses, the app will handle the rest. Each of your loved ones will receive a custom holiday card in the mail within a matter of days. This app makes it much easier to show your friends and family members around the world that you’re thinking of them during the holiday season. Need more tech advice? Trust the experts at Fix Apple Now to repair your LCD, cracked glass, battery, home button, power button, audio jack, water damaged device and more. Our professionals offer customers a 90-day warranty on all repairs, plus most iPhone repairs can be done in less than an hour.